This classic—involving a beautiful princess, a sleeping enchantment, and a handsome prince—one of Tchaikovsky's three perennially-popular ballets, draws upon a European folk tale dating back to at least the early 14th century. It was first published by Charles Perrault, as La Belle au bois dormant, in 1697, which was later followed by the version collected by the Brothers Grimm, transmitted orally from the original version of Perrault's literary tale. The current Colorado Ballet production is based on the original scenario, conceived by Ivan Vsevolozhsky, and the choreography of the original ballet, by Marius Petipa, which premiered at the Marinski Theatre in St. Petersburg on January 15, 1890. 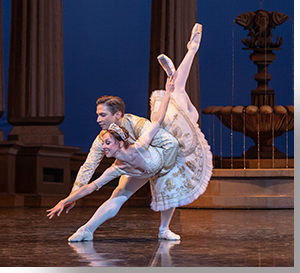 As staged by Sandra Brown, Lorita Travaglia, and Maria Mosina, the story is beautifully conveyed by the principals, soloists, and the corps de ballet. Dana Benton shines as the 16-year old Aurora, who falls victim to the evil witch Carabosse (Gregory Gonzales), whose spell is partially amended by the Lilac Fairy (Asuka Sasaki), and finally broken by kiss from Prince Desiree (Yosvani Ramos). 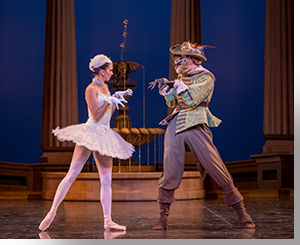 In a dramatic arc bearing a strong resemblance to Benton and Ramos' delightful work as Clara and the Nutcracker Prince in last winter's The Nutcracker, the pair continues to evince sweet stage chemistry and choreographic sympatico. Sasaki's elegant and graceful Lilac Fairy also bears a resemblance to a character from Tchaikovsky's The Nutcracker— the Sugar Plum Fairy—in the sense that she enables the heroine's passage from girlhood to womanhood. The principle divergence between the two scripts is the flip in Gregory Gonzales' character from Herr Drosselmayer to Carabosse, from white magic to black magic. Gonzales' pantomime and acting talents make both characters larger-than-life archetypes. Another delight of the story is it's liberal borrowing of characters from Perrault's other fairy tales, such as Puss in Boots, the White Cat, and Red Riding Hood. The production's set and property (Michael Eagen) and costume (Anne Armit and Shannon Lovelace) design make beautiful use of the Royal Winnipeg Ballet's set and costumes. While one could only speculate on what Joseph Campbell and Carl Jung would say about the nature of this tale, or its contrapositive, Beauty and the Beast, it is clearly about the power of love overcoming evil (via a kiss), which we're glad to see is still a popular notion, despite much of what is being generated by powerful interests around the globe. Meistro Adam Flatt and the Colorado Ballet Orchestra, warmly render Tchaikovsky's beautiful score. 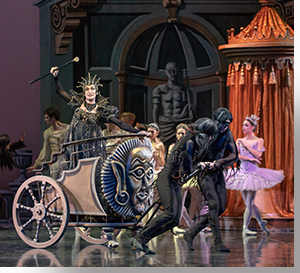 The Colorado Ballet's presentation of Sleeping Beauty runs through October 14th. For tickets: https://tickets.coloradoballet.org.